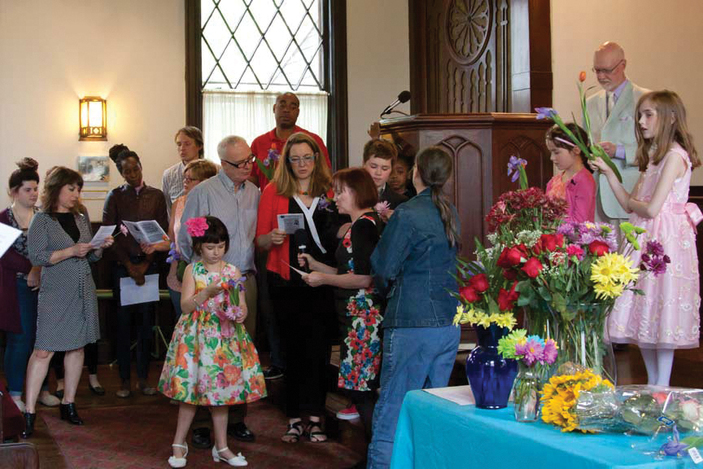 Children's Flower Communion, with former consulting part-time minister, Rev. Darrell Berger. We welcome you and your children to the UCSI. Religious Exploration (RE) has been an integral part of the UCSI experience. Our program has traditionally been open to everyone, regardless of religious background or present beliefs. We strive to create an atmosphere that respects and values individual differences. We have learned from one another and grown together as we shared a rich variety of religious and cultural experiences. As a part of that process, we are currently revisiting ways to bring Religious Education (RE) to the children of friends and members of the church. If you are interesting in RE or childcare for your children, please contact us. 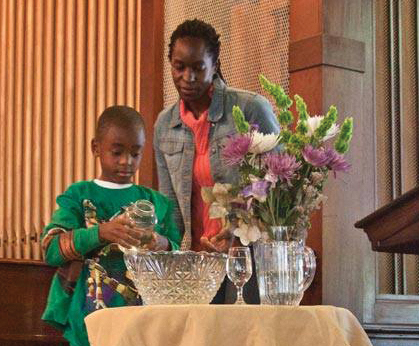 Mom and son participate in a UU water ceremony.